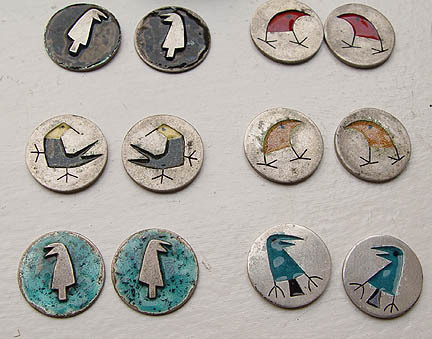 Earlier this year, I had the opportunity to purchase a group of silver items by Betty Cooke. This grouping includes the items pictured below: cufflinks, a pendant, a brooch, two single ear rings, and the other, round pieces shown. 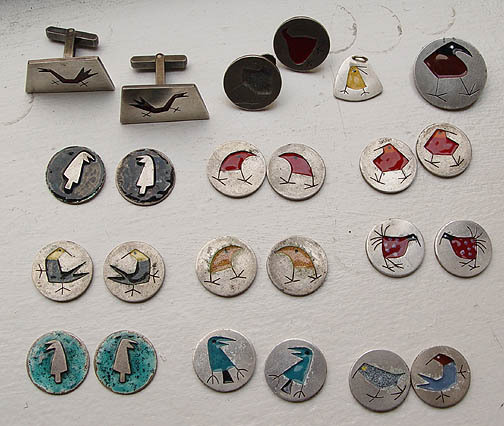 These round pieces, nearly all of which are in pairs, lack findings of any kind and were probably originally intended to be earrings, although as so many are slightly imperfect, Betty Cooke may have decided to set them aside rather than making them into a product for sale. The dealer from whom I purchased this collection had acquired these pieces from a woman who was an art teacher who worked with and befriended Betty Cooke in the late 50s/early 60s. 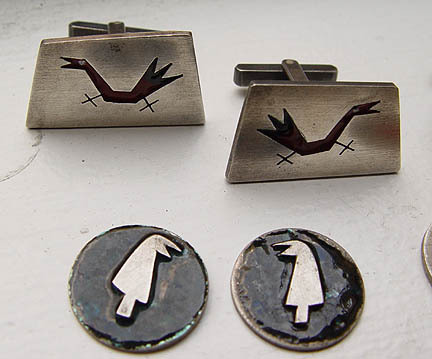 The pieces are all unsigned, save for the cufflinks and yellow bird pendant which are stamped COOKE. 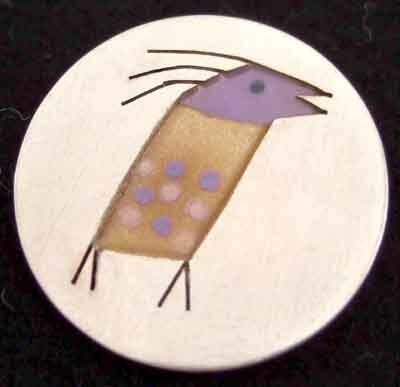 Betty Cooke loves to depict birds in her work, and to see so many of her amusing and fascinating birds at once is a joy and the main reason I bought this collection. 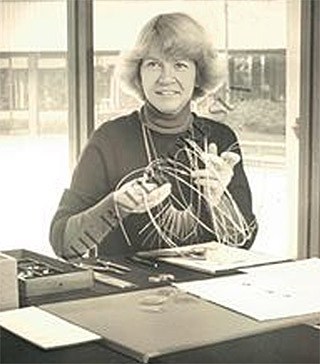 Betty Cooke is a Modernist jeweler located in Baltimore. She still works today. What a great find! 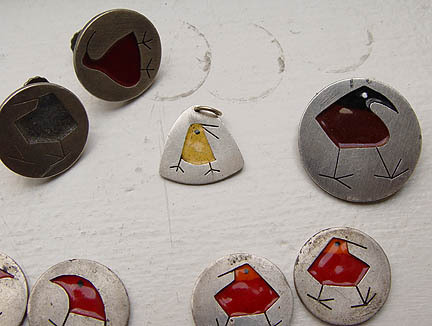 It is not usual to find enameled examples of her work. Congratulations. That's a great piece! Is it a pin? I can't wait to see what else you have to show. Yes it is a pin ... about 1 inch. A group of us are going to collaborate on something... Hopefully soon..... Stay tuned. Those are great Cooke pins. I'm soooo envious! We are getting closer. I just finished editing the photos and the first draft is done. While the daft is reviewed and the photos are selected, I felt we needed to share with you another photo. Here is a preview to the Betty Cooke Article. That is wonderful Scott! This the sort of information that should be gathered on as many folks as we can. Thanks for the effort and research. I was only responsible for a small part, the rest was a group effort. The group wants to remain anonymous. 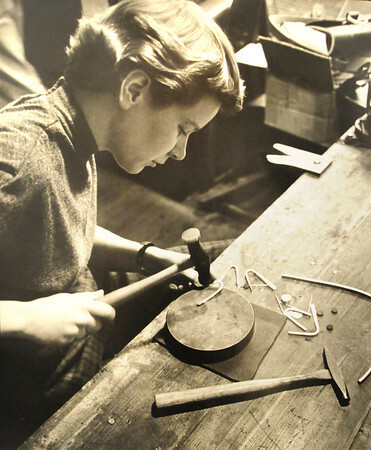 It is efforts and articles like this and the one that Marbeth Schon did of an interview with Cooke, that help us to appreciate these craftsmen and women and to understand what an influence they have had on us and the way we look at jewelry. My hat off to you and your anonymous elves. The additional Betty Cooke images went up after the article so if you didn't see page two (click here). This month's antique jewelry column in Maine Antiques Digest has a picture of another lovely Betty Cooke brooch of wood, silver and gold, which was sold at a recent auction. Not having heard of Ms. Cooke's work prior to this posting, it's fun to learn about her. A definite stop on my next trip to Baltimore! 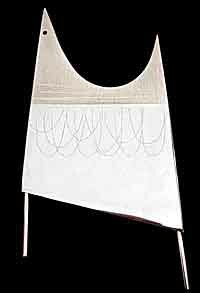 I am interested in seeing more examples of Betty Cook's designs. I especially like her enamels .... If you have examples please post them. The Betty Cooke Article includes lots of photos. I believe (not sure) this is another early photo of Betty Cooke. Can anyone confirm?